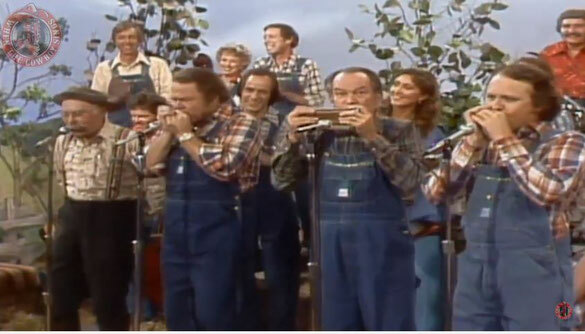 The Hee Haw Harmonica Band performs "Kingdom Coming (Instrumental)"live on Hee Haw 1980. Go long de road some time dis mornin', like he gwine to leab de place? He took his hat, and lef' berry sudden, and I spec' he's run away! De massa run, ha, ha! De darkey stay, ho, ho! It mus' be now de kingdom coming, an' de year ob Jubilo! His coat so big, he couldn't pay the tailor, an' it won't go halfway round. I spec' he try an' fool dem Yankees for to tink he's contraband. Dey move dar tings into massa's parlor for to keep it while he's gone. I s'pose dey'll all be cornfiscated when de Linkum sojers come. We lock him up in de smokehouse cellar, wid de key trown in de well. He's ole enough, big enough, ought to known better dan to went an' run away.